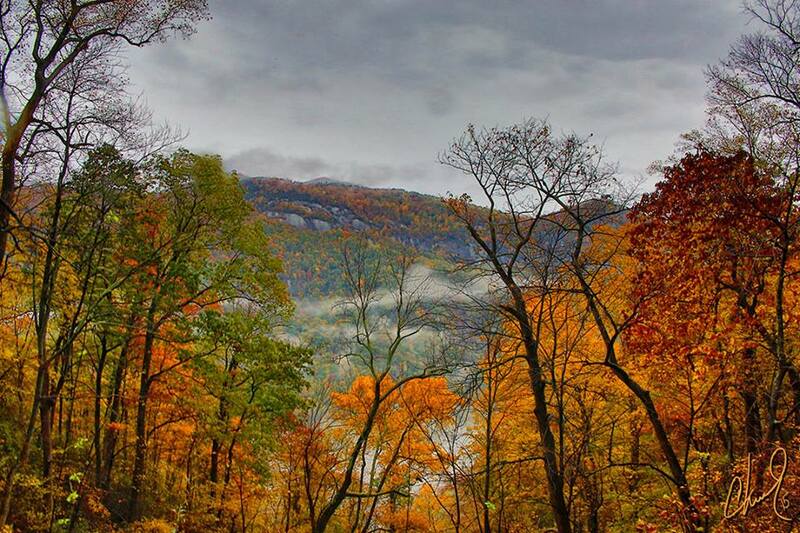 Peak is passing at our elevation (2,300 feet), and this will be our final fall leaf report for the Asheville, Black Mountain and Old Fort, NC, area for 2015. The scarlet, bronze and rust-colored tones of oak leaves will remain on the trees around here for another week or two, but other trees are fading fast, with the exception of some beech trees that decided to bring some good pops of orange/yellow to the end of the annual fall foliage journey in western North Carolina. Toms Creek Falls in Marion: This is one of our favorite easy waterfall hikes, and the tree types that are present on the trail are perfect for late fall color viewing. In addition, there’s a really cool former mica mine near the falls, as well as a new waterfall viewing platform. We did a blog post last year about Toms Creek Falls with more details. 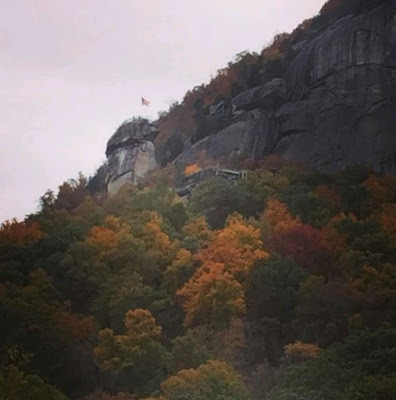 Chimney Rock State Park: Located 30 minutes south of the Inn on Mill Creek B&B, Chimney Rock State Park is a popular place to see fall color in early November. That’s typically their peak fall color time. 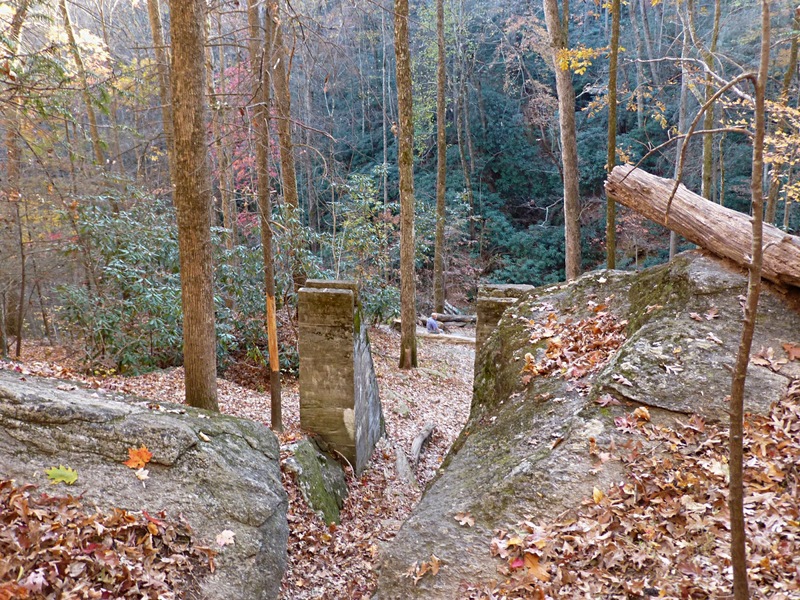 Hike to the bottom of the 404-foot Hickory Nut Falls, check out the Four Seasons Trail, or climb to the top of the Chimney, a large granite monolith with views of Lake Lure and Hickory Nut Gorge, on your way to the Skyline Trail. Note that as we write this, the elevator to the Chimney is undergoing maintenance and the way up to the Chimney is via the Outcroppings Trail, a set of stairs leading to the top. 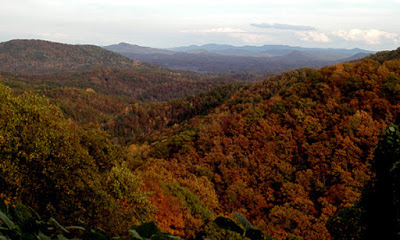 For more information about Chimney Rock State Park, check out www.chimneyrockpark.com. 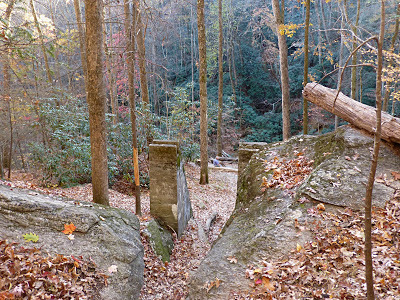 Point Lookout Trail near the Inn on Mill Creek: Point Lookout Trail is a fabulous 3.5-mile greenway trail. If we’re having a rainy November day, it’s great to walk on as it’s paved. One end, near Ridgecrest, is right next to the start of our road — Mill Creek Road — so it’s easily accessible. The other end is accessed by going to the other end of our road and bearing right onto the next portion of Mill Creek Road, and then turning right at the T-intersection of Mill Creek Road and Old US Hwy 70. From the Ridgecrest end, the Point Lookout overlook is about a mile down the greenway, looking out over 24 miles of Royal Gorge and peaks in the 2,000+ foot range. Lots of oak trees mean superb color in late October and early November. North Carolina Arboretum: The North Carolina Arboretum features many different tree types, as well as interesting garden spaces, an exhibit hall, and an extensive trail system. One of our favorites is the Bent Creek Trail, a little over a mile in length, that meanders with Bent Creek on the northwest side of the Arboretum. 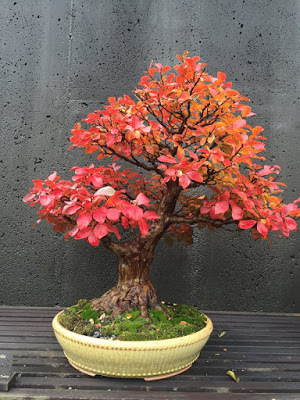 And don’t miss the bonsai exhibit…see fall color in miniature! 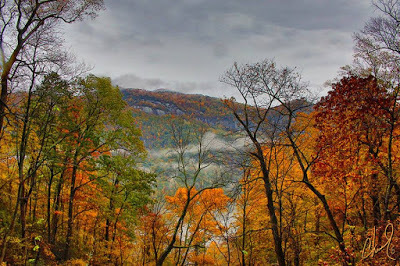 This entry was posted in Fall Color Reports and tagged Asheville, fall foliage, hiking, NC Arboretum, outdoors by Inn on Mill Creek. Bookmark the permalink.